Orignally posted on Culinary Wannabe – this is one of my favorites! Does the name alone have you swooning? Oh yes, they are just as good as they sound. Cream cheese brownies were already one of my favorite desserts, but the mint in these took them to a whole nother level. Chocolate and mint – it’s not just for girl scouts anymore! Keep the leftovers (if there are any) in the fridge, as they are totally awesome cold. Spray a 9-inch square pan with non-stick spray. In a large bowl, combine chopped mint chocolate and butter and melt in microwave on low. Start with 2 minutes, then stir, and continue cooking at 30 second intervals until completely melted. Add in flour, cocoa powder, salt and vanilla, and mix until combined. Pour into pan in a thin even layer. In a separate bowl, beat together the cream cheese, egg yolk, sugar and mint extract until smooth. Place dollops of cream cheese mixture sporadically over the initial brownie layer, and using a dull knife, swirl together. Bake for 25-30 minutes or until that batter in the middle is just set. Let cool and cut to serve. I also preferred these chilled, so I kept them in the fridge. 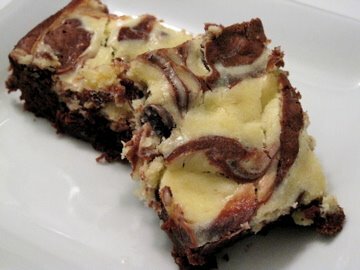 Posted in Recipes, Sweets and tagged brownies, cream cheese, mint. Bookmark the permalink.